Nature really does provide some of the most exciting inspirations for the world of fashion. As clothing design moves so fast, it needs a near-endless source of inspiration, making nature the prime candidate for this source. Here, Rosch have taken full advantage of it. The myriad colours of the butterflies, the vibrant greens and oranges of the leaves and the overall complexity and richness of the design all work to make this a beautiful and eye catching number that's familiar to anyone. It is ideal for a tropical setting in particular. 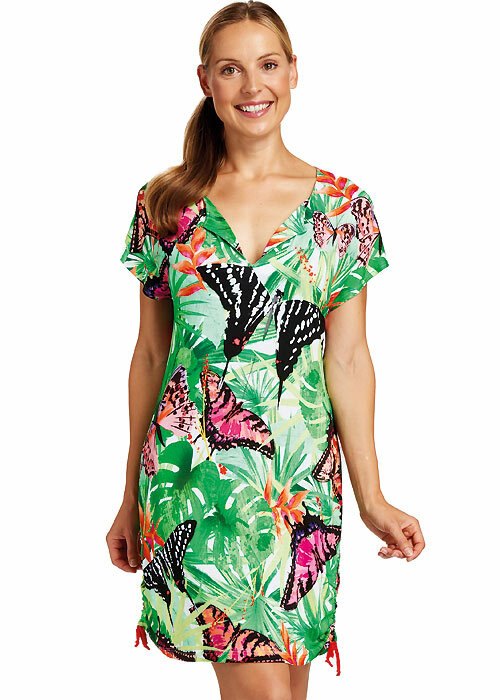 This sun dress is quick to slip on and provides protection from the sun from above the knee to your shoulders and upper arms.Matching items available.